How Much Water & Sun for Tomato and Bell Pepper? Hello everyone, i have a german quen strain of beefsteak tomatoes and a purple beaty bell pepper in seedling stage. they seem to be groing out but i am curious as to how much water and sun i need to give these plants every day. is there to much? pastrycheffowler wrote: Hello everyone, i have a german quen strain of beefsteak tomatoes and a purple beaty bell pepper in seedling stage. they seem to be groing out but i am curious as to how much water and sun i need to give these plants every day. is there to much? Tomatoes and bell peppers like sun. Not sure if you are growing them in pots or in the ground since you haven't mentioned that. If in pots, they will need more water than if in the ground since pots tend to dry out quicker. You can over water tomato plants and when this is done the tomatoes will split open as they ripen. I had that happen to me several times over the years when getting heavy rainfall for days on end when they were ripening. It just comes with the territory. I live in Zone 9 in New Orleans and our summers get very hot, so I water at least 3 times a week, and pretty deep watering when I do. Can't answer your question without more information. As gumbo said, it makes a big difference whether these are in containers or in the ground. Also where you are located. I am in Ohio. My in ground tomatoes will benefit from as much sun as I can give them, all day direct sun. People in the south with super hot summers, need to give their tomatoes protection from hot afternoon sun. terribly sorry, i live in southern California, 20 miles or so from the beach, the sun is a little intense this time of year. these plants arr all in a line in my backyard. and they get great sunlight from roughly7am till about 6pm. everything is in pots too. my bell peppers and tomatoes are in a 2x2 ft wooden box with a wooden back frame for vines. You are near the coast so do you have a coastal climate? If your summer temperatures go over 85 degrees you can expect bell peppers and tomatoes to stop producing or dropping blossoms from the heat. Heat tolerant tomatoes will still produce in higher temperatures as long as they stay under 100 degrees. Heat tolerant tomatoes are HeatwaveII, Arkansas Traveller, and Super Sioux. Cherry tomatoes can handle heat better than big tomatoes. If it does get very hot in summer, shading or planting something like squash on an overhead trellis can help provide shade for some plants. I live at 603 ft above sea level in Central Oahu and I am 5-9 degrees cooler than the coast and get a little bit more rain, but not as much as the windward side. Max temperatures in summer can get into the low 100's. Only the most heat resistant tomatoes will continue to produce fruit in the high 80's. Bell peppers are grown in the cooler parts of the year. Hot peppers on the other hand can handle the heat. Tabasco peppers do very well even in the heat. I can also grow heat tolerant cucumbers. Suyo long is a favorite variety that does well even in 80 plus temperatures which are the norm. If your temperatures get fairly high, you could consider varieties that are recommended for your area that are heat resistant. OK summer in southern calif, with plants in containers, it will be hard to give them too much water (assuming your containers have good drainage). Depending on what is in the pots you will likely need to water every day, maybe even twice a day in heat of summer. You said everything is in pots in a line in the backyard and then you said tomatoes and peppers are in a 2x2 box. So what is in the pots? Is that the strawberries and watermelons from your other thread? Anything else? A 2x2 box is about enough room for ONE tomato plant. Is it sitting on the ground so that the plant can root down into the native soil? If yes, it won't need to be watered quite as much. Water deeply but a little less often. 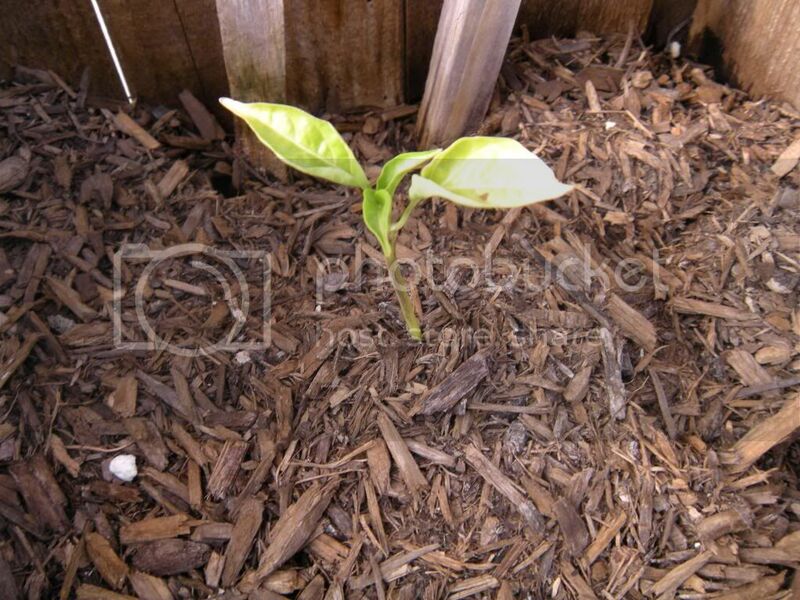 Mulch over the top of the soil. yes the items from my other posts are in the other pots lined up with these, and they are put on concrete, so they cant go into native soil. Bell pepper is not at all thriving, may die- very yellowed, curled leaves. I wouldn't have set a plant that tiny in the ground yet. Tomato looks better but still a bit pale and not quite thriving. Soil looks hard and dry and is likely lacking in nutrients. Sorry, but you asked. In line with what I said in the other thread (strawberry and watermelon), and to help these plants grow better, I think best way to proceed would be to fill these boxes higher and bury both tomato AND pepper to an inch or two below full sized leaf so they can root further up the stem. You'll want to add more nutrients and mulch the surface to retain moisture. I would start by scratching in some fertilizer according to package instructions for the size of the container/size of the plants. (FWIW I am taking the easy way out this year and trying Dr. Earth all purpose 4-4-4 for the initial feeding, then Tomato and Vegetable 5-7-3 later on -- I'm NOT PROMOTING DR. E... It's just that I went to my local hardware store's annual one day only 20% off sale and they stock full line of Dr. E products... ), THOROUGHLY WATER, then start filling with premium potting mix containing added mycorrhiza, then "mulch" the top 1-2" with straight compost. The mycorrhizae will help break down these woody mulch like materials into nutrients for the plants. The fertilizer will support them until that happens. Be aware too that the wooden container will evaporate and dry out faster so you'll need to be diligent about watering. You may want to make some helpers by poking a few small holes in plastic soda/water bottles, burying them in the corners of the container and filling with water. (You want them to drain out slowly, not all at once -- experiment before burying them. Oh -- keep the caps and put them on after filling each time to keep out the mosquitoes.) When you do water, make sure to thoroughly soak the wooden containers from the outside as well. As these plants grow, keep adding more potting mix and compost until the box is filled to just two inches below the rim. You want to give them as much soil volume as possible. Yep, those are some hungry, hungry plants! And I understand what you mean about the sun being intense, even if it's not a million degrees. You may want to get some shade cloth to cover them in the afternoon come mid-May. Assuming they were properly hardened off, they should be loving the sun til then! thanks for your input everyone, i purchased some potting soil from Kellogg and some more vegetable compost. 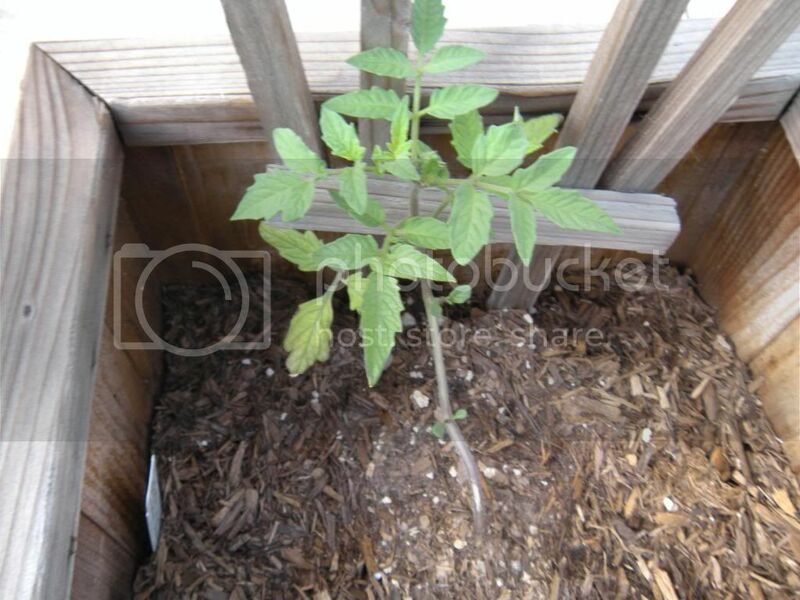 i put a good 3-4 inches of the compost in with the tomato plant and then a 1 inch layer of potting mix, a little less of the compost on the bell pepper, how often should i be pulling out soil and adding more compost? also i have 2 32 ounce jars of "worm casting" that i got for 2 bucks a pop at a farmers market, but have no idea of how to use it. everything else got a good amount of compost then potting soil as well, suddenly all my plants seem so small again because i did make sure to go right up underneath the first set of leaves. im very grateful for forums like these because without em i would be losing plants like no tomorrow. It's beginning to seem pretty mysterious. From what you are telling us you started with good enriched organic soil (I don't remember if you said was it topsoil, potting soil, seed starting mix -- hopefully not, seed starting mix is sterile, without nutrients) and have been adding lots of good stuff. And yet your plants are acting like they are in desert sand. These are all in containers? Any native soil or just the bagged stuff? If they don't perk up with the recent additions, this would be where I would think about getting your soil mix tested to see what is going on. If you started with good soil, you shouldn't have to be pulling any out, just adding nutrients from time to time (this would be things like fish emulsion, kelp extract added to the water, or bone meal, blood meal scratched in to the soil). i purchased"soil" from a local organic grower, they make it themselves with worm casting and compost, my thoughts are that it wasn't distributed properly or something, now my plants are all perking up with the exception of the strawberry and watermelon, the watermelon has brown spots that are getting bigger, and the leaves from the strawberry are almost all dry and brown. i received quite a bit of fruit of this strawberry plant, so im wondering if it is done for the season. any thoughts on why the brown spots on my watermelon plant are getting bigger? My tomatoes looked like that when I had used a potting soil that was 60% compost. I usually do not use potting soils that contain more than 20% compost. Are you sure you got potting soil and not garden soil? The particles are fairly big and looks more like compost or garden soil. Garden soil is not intended to be used in pots. It can steal nitrogen from your plants. Tomatoes and peppers are heavy feeders. How much fertilizer and what kind do you use? If your pots are on concrete, they may heat up more as the days get hotter. You might want to double pot or shield some of your pots when it gets hotter.